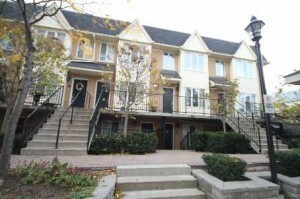 The Most Desirable 3 Bedroom Townhouse In `the Kings` Complex. The Largest, The Most Private Entrance And Best Corner Location With Huge Rooftop BBQ Sundeck. Light Shines In From Multiple Exposures Highlighting The Stunning Designer Interior! Fully Renovated With Multi-Tone Floors, Quartz Kitchen Counters, Designer Backsplash, Re-Modeled Bathrooms, Custom Mouldings, Closets, Fireplace, California Shutters, Rooftop Decking, And So Much More. 3 bedrooms, 2 bathrooms, with 1 parking space and 1 locker.